It started with poetry when I was a child, and in midlife I started to write for magazines as a freelance arts journalist. I wrote regularly for Music Maker, The Australian, Dance Australia and other journals. I’d always wanted to write fiction (in fact, when I was about seven I used to tell people I wanted to be a ‘children’s authoress’ when I grew up!) but stories never seemed to make their homes in my mind. Then suddenly an idea came to me – a story about a girl who was sold into slavery and travelled around the world (her world, not this one) – with the daughter of the family that bought her at the slave market. It’s not a bad story but it bears the stamp of ‘first novel’ and is unlikely ever to see daylight. Queen Ellyria just wants her sick triplet sons to live, each ruling over a third of the kingdom as their dying father decreed. When she finds herself trapped in a deadly bargain with a dark spirit, she recruits a band of young mages to help – but a terrible curse takes over. Its stand-out difference is that the main character, Ellyria, is a middle aged woman. However, romantic interest is provided by her new daughter-in-law, Tammi, who marries Beverak, one of Ellyria’s sons. It’s an arranged marriage, but Tammi and Beverak fall deeply in love and despite a shocking accident and the horrors of war, they learn together how to be good rulers of the land of Dresnia. At a convention in 2003, I did a mini-workshop with Lee Battersby. He told us to choose a building we knew well and change it to another use, then have someone approaching the building with a particular aim. I chose a nineteenth century neo-Gothic hotel I’d worked at in Devon, UK, in my backpacking days. It was easy to turn it into a castle, and to see a man – a magician – leading his horse up a steep, cobbled roadway that led to the castle’s gatehouse. He was going to tell a newly-widowed princess that she and her infant son, now king of the country, were in danger from a would-be usurper. The next day Lee had us read our scenes out loud to a panel that included guests-of-honour Lynn Flewelling and Fiona MacIntosh, and they urged me to develop the idea into a book. So the scene I wrote became the kick-starter for my trilogy, The Talismans. You will read it in book two, The Cloak of Challiver, which is due for publication mid-2015. George RR Martin’s magnificent tome The World of Ice and Fire. I’m also dipping into Karen Miller’s new book, The Falcon Throne. I really want to see the entire trilogy published. The Cloak of Challiver is nearly finished and the last book, The Seer of Syland, is simmering away in the back of my mind. Whether or not I have any more books in me remains to be seen! Wide open spaces, beautiful green cities and no overcrowding! That it is multi-facetted. If you want a short, easy read, there are plenty of them to choose from. If you want depth of characterisation, there are books that will fill the bill. If you love history, historical romances aplenty await. And if you like speculative fiction, you can find stories of romance coupled with space travel or magic. There are even romantic tales that double as police procedurals! It’s not just doctors and nurses anymore, or tales of servant girls marrying the master’s son. We now have strong, independent female characters and men who are real people with their own problems and fears, not just the strong, silent types of thirty years ago. The Cloak of Challiver, sequel to The Dagger of Dresnia, is scheduled for release in the middle of next year. It has two romances, involving girl cousins who make love matches very different from each other – and with very different outcomes. Seeing my first novel in print was a huge thrill. 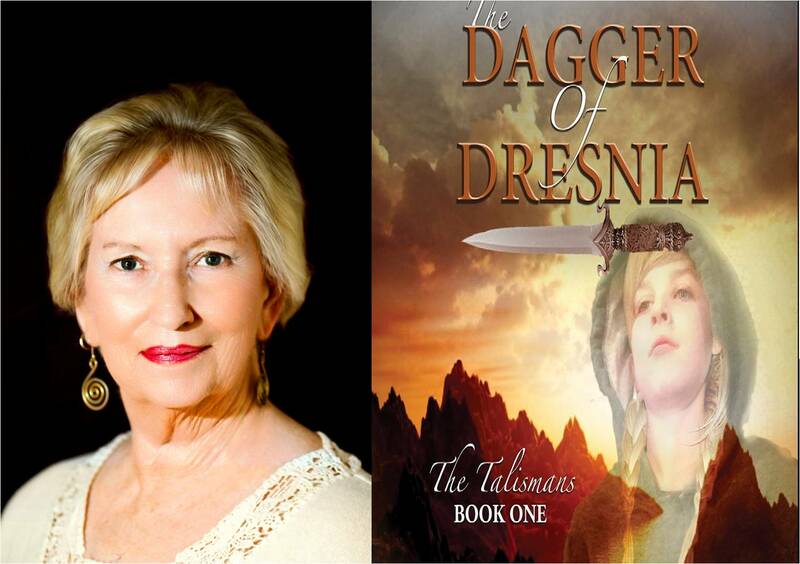 The Dagger of Dresnia took five years to write – and a further five years to sell! The big problem with conventional publication is that you have to get your novel onto the desk of an editor who just happens to be looking for that particular kind of story on that particular day. Sheer luck is involved – no matter if you’ve written the best romantic fantasy in years, if it only gets seen by editors who are looking for steampunk or space operas, it just won’t get bought. So finally finding a home for my trilogy was a really Big Thing! I’ve also been on panels at several conventions and taken on a gig at the Katharine Susannah Prichard Writers Centre here in Perth, mentoring new writers. That was very satisfying as I was finally able to pay the writing community back a little bit for the enormous amount of help I’ve had from fellow authors along the road to publication. The newly widowed Queen Ellyria just wants her sick triplet sons to live, each ruling over a third of the kingdom as their dying father decreed. When she finds herself trapped in a deadly bargain with a dark spirit, she recruits a band of young mages to help – but a terrible curse takes over. The Dark Spirit befriends her enemies and seduces her friends, and Ellyria soon finds that famine, betrayal, pestilence and bereavement are all in its arsenal. Can Ellyria unite the elvish and mortal sides of her family, and in so doing, save the kingdom?